The Unexpected Revival of Birkenstocks. | A Continuous Lean. The Unexpected Revival of Birkenstocks. A decade ago if you asked anyone what they thought of Birkenstocks their answer would’ve probably included some contrarian remark about either dead heads, frat bros, or both. For at least some of us though, these connotations are now a thing of the past, as we have entered into a new era in which Birkenstocks are not only acceptable, but dare we say stylish. First produced in Germany in 1774 by Johann Adam Birkenstock, the brand’s signature slip ons have been celebrated for centuries as some of the world’s most ergonomically advanced footwear. When they were introduced to the U.S. in the sixties, they were immediately polarizing, as those that adopted Birks praised their comfort, while those that disparaged the shoes wrote them off as being plain old ugly. 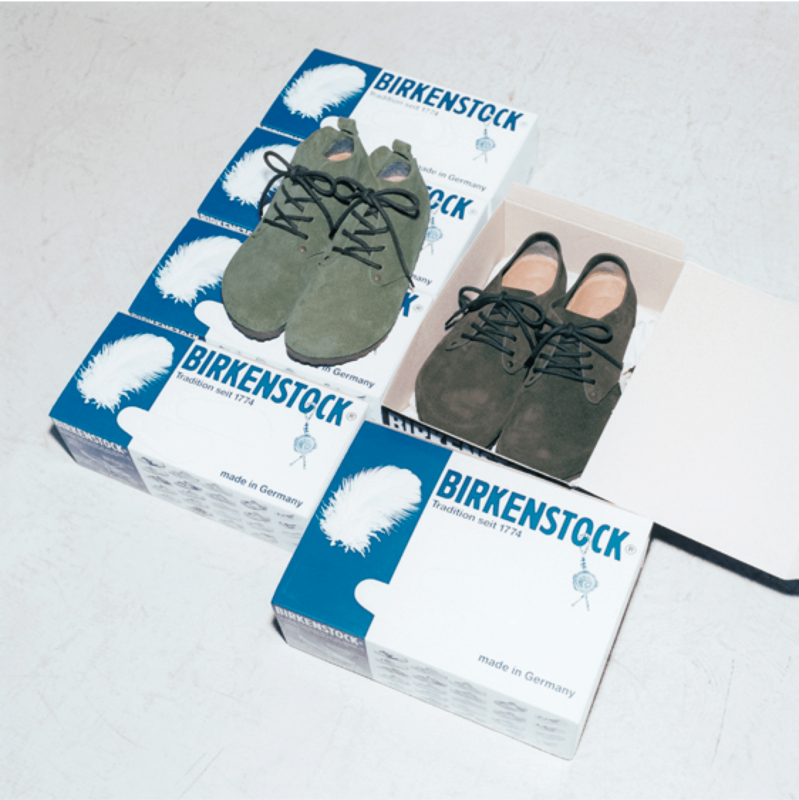 The shoes outdoorsy fans could care less about their critics, and Birks became an integral part of this culture, which in turn actually helped to make the shoes fashionable as mountaineering style has become popular during the past few years. I’m gonna hold out until Earth Shoes come back. I don’t see any mountaineering connection, however. are the top ones bostons? if so, any idea where to pick up those colours? There is a lot of similarity between the classic Birkenstock wide strap leather sandals and some sandals that I’ve seen in Men’s collections for spring. I dig it. Nothing sexier than a girl in Birkenstocks? I always felt self conscience with guys joking my birks. Now it’s cool WTF! Figure it out guysâ€¦..
Long-time fan of Birks. They last forever if cared for and resoled properly. Boston and London for work. Super Birki in the rain. Zurich around the house. The third photo looks like Dundee and Maine lace ups, which I’d very much like to try. Might be a good choice for someone who wants a classic Clarks look, but needs better support. @masonc they’re called amsterdam room shoes. i never stopped wearing the pair of Birkenstock sandals i bought nearly 15 years ago intheTwinCities. super-quality footwear & brand. Frat bros? I never saw a single member of a fraternity wearing Birkenstocks at my private college or public grad school. Now, my friends and I did wear them (Arizona model) to the occasionally decent parties at those places of group conformity. I get the Dead heads and patchouli thing, though they were usually the Stuck-in-the-Sixties hippies with love beads. Even we made fun of them. We were into hiking though, so maybe there’s that “mountaineering” connection (but we used rough-out boots with Norwegian welts). It’s always hilarious to me when ACL notices some ancient line of clothing, and “re-discovers” it as suddenly marketable for its fashion aesthetic to the 20 and 30-somethings who shop at “pioneers” like Unionmade. Closed models of Birkenstocks have always been around. Kudos to ACL for great market research on its (probably) majority reader demographic. Still, I read ACL for moments like this one, so thanks kindly for the chuckle. Kalso Earth shoes were very comfortable, though a little break-in period might have been needed for the negative heel. Unfortunately 2011 was the last year for men’s versions. You might try the website for your closest retailer, because the little store I’ve been to here in SoCal has dragged out a couple of dead-stock men’s shoes. And, if you can fit in them, there are a few of the women’s that aren’t totally “yoga class,” i.e., a couple of trainers, the old Trigg model, and the Pace.